In the following we explain how to go to INRIA from Paris, Versailles and airports. Note that INRIA is not too far from Versailles but that one has to use transportation to go there from Versailles. For those who lodge in Versailles special shuttles are organized to go from the hotels in Versailles to INRIA. 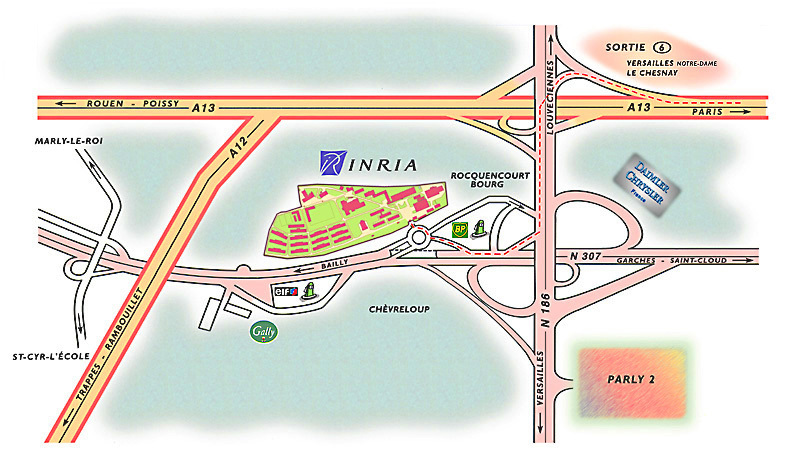 but it is also possible to go directly to INRIA from Paris by car (see below). 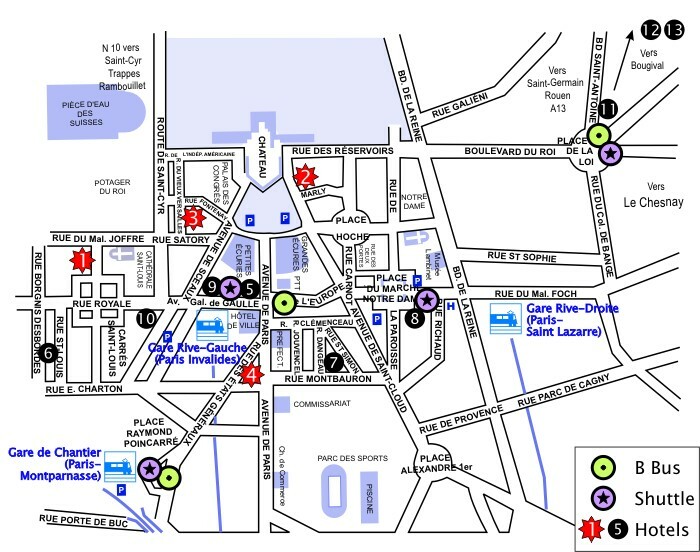 Check the location of the conference hotels in Versailles on the map below.Most hotels are located at walking distance to the railway station "Versailles Rive Gauche". Here is a map of all suburban trains (RER). From Roissy-Charles de Gaulle airport (CDG): take RER B to St-Michel station and then transfer to RER C to Versailles, time: 1h30, about 10 Euros. When you arrive at Roissy-Charles-de-Gaulle airport, go to the RER-TGV station by pedestrian walkway from Terminal 2 and by airport shuttle from Terminal 1. At the RER-TGV station, you can buy a ticket to Versailles Rive Gauche (aka Versailles R.-G.). Take the RER B (suburban train) to Paris, Saint-Michel station (you can take any train to Paris, all of them stop at Saint-Michel station). At Saint-Michel station, transfer to RER C direction "Versailles Rive Gauche - Chateau" (direction C5). Be careful: only 1/3 of the trains RER C go to "Versailles Rive Gauche - Chateau". Do not take a train to "Versailles Chantiers": it takes a much longer time to reach Versailles by taking this direction. From Orly: take Orlyval to Antony station, then RER B to St-Michel station and transfer to RER C to go to Versailles, time: 1h20. At the Orlyval station in the airport, you can buy a ticket to Versailles Rive Gauche (aka Versailles R.-G.). Take a train (Orlyval) to Antony (last stop). At Antony, take the RER B (suburban train) to Paris, Saint-Michel station (you can take any train to Paris, all of them stop at Saint-Michel station). At Saint-Michel station, transfer to RER C direction "Versailles Rive Gauche - Chateau". Be careful: only 1/3 of the trains RER C go to "Versailles Rive Gauche - Chateau". Do not take a train to "Versailles Chantiers": it takes a much longer time to reach Versailles by taking this direction. Orly - Versailles : about 40 E (day) or 50 E (night). CDG - Versailles : about 55 E (day) or 80 E (night). and then take the RER B line to downtown Paris (7.70 E) (CDG RER B). - by shuttle: AIR FRANCE CARS to Paris, frequency every 4-15 mn (10 E), (CDG shuttle). - by train (RER): take the orlyval to the RER B station and then go to Paris (8.75 E) Orly RER B. - by shuttle: AIR FRANCE CARS to Paris, frequency every 15 mn (7.5 E) Orly shuttle. There are two main train stations in Versailles: Versailles Chantiers and Versailles Rive-Gauche (aka Versailles R.-G.). Note that many hotels are close to Versailles Rive-Gauche. One need to buy a special ticket in Metro or Railway station to go to Versailles (2.45 E). - by RER C from downtown Paris, direction C7 (St-Quentin), frequency every 15 mn, duration: about 30 mn, from station St Michel-Notre Dame. - by regular train from Montparnasse railway station, frequency every 15 mn, duration: 10 or 20 mn. - by RER C from downtown Paris, direction C5 (Versailles R.-G.), frequency every 15 mn, duration: about 30 mn. For further details and time schedules please use the RATP route finder. There are two possibilities: special organized shuttles or public transportation (bus). and stopping at three locations ("place du Marché", "place de la Loi", "Parly II" (same stop as line B)), count 3mn between stops (cf map below). A return from INRIA to Versailles will also be organized after the conferences. At Versailles Chantiers, departure of the shuttle is located on the left when you get out of the station. Take the small staircase downto the car park. The shuttle will be waiting there. At Versailles Rive-Gauche, departure is at the bus stop on the left when you get out of the SNCF railway station, by the taxi rank. Regular buses are also available: line B (direction INRIA), last stop (see here for more details on regular buses in Versailles). the bus stop is located at 200m from the station (cf map). The frequency is every 10 mn, (1.30 E), duration: 30 mn. Take the A13 highway (direction Rouen).Then take exit n° 6, direction St Germain en Laye , Versailles-Notre Dame. Turn left n° 6, direction St Germain en Laye , Versailles-Notre Dame. for Versailles. Then take the second on the right (approximately 200 m further on), direction, Bailly, Maule. The INRIA is to 250 m on the right, after a BP service station. The distance from Paris/périphérique to INRIA is approximately 15 km. Last modification on March 17, 2003.